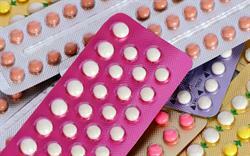 Quickly compare key features of hormonal contraceptives with the MIMS contraceptives table. The table covers combined, phasic and progestogen-only contraceptives, and shows the hormone dose in microgram and the cost of 3 months’ supply for each brand. Combined products include preparations of estradiol, ethinylestradiol or mestranol with the progestogens desogestrel, drospirenone, etonogestrel, gestodene, levonorgestrel, nomegestrol, norelgestromin, norethisterone and norgestimate. The combined transdermal patch (Evra) and vaginal ring (NuvaRing) are listed. Phasic preparations covered are the combinations of estradiol/dienogest, ethinylestradiol/gestodene, ethinylestradiol/levonorgestrel and ethinylestradiol/norethisterone. Progestogen-only pills listed are desogestrel, levonorgestrel and norethisterone.